More than just a few musicians, Family Band—consisting of husband and wife Kim Krans and Jonny Ollsin, who also plays in skate metal band Children as well as Scott Hirsch—are a lifestyle. From their cabin upstate, they record dark folk music that wrestles with their relationship to an expansive place they are trying to make into their home from the ground up. On concept alone, it's romantic and enviable, but the music itself is also substantial, deceptively simple and worth spending some time with. Naturalismo has a couple songs from their full-length Miller Path. 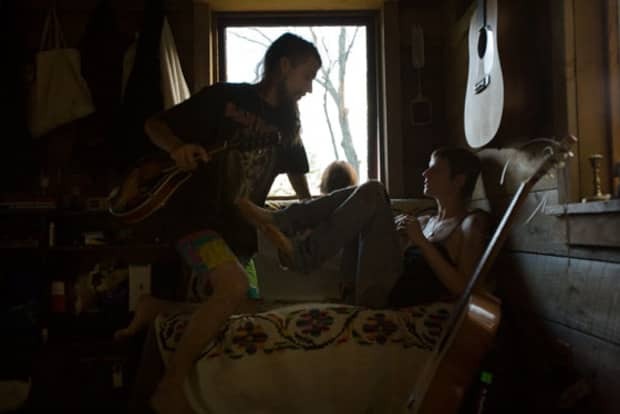 After the jump, read our newsprint on the band and their cabin from FADER 63. Family Band unofficially began when husband and wife Jonny Ollsin and Kim Krans played a friend’s baby shower. They’ve since added a bass and lap steel player, close friend Scott Hirsch, but the property they own and visit every weekend in Delhi, a small town in New York’s Catskills, is Family Band’s silent fourth member. They built a midsized cabin themselves—it has plenty of porch as it’s easiest to construct—and hope soon to add a sauna and a small shack to exclusively hold a grand piano. So far nothing terrible has happened—the cabin isn’t falling down, the wood isn’t rotted and the pipes aren’t bursting, and though there’s still work to be done, it’s a refreshing break from the sustained adolescence New York’s budget and space restraints often force. Any extra money Ollsin and Krans make goes right back into the property. “It’s like, Hey we can go hang with our friends in LA for a few months, but we actually can’t because that money is going to go upstate,” Ollsin says. Although their weekend retreats have narrowed their social lives, the cabin’s calm is it worth it. “We were recording up there and I was just standing on the deck, looking out into the sunshine, and I was like, Wow, why would we ever want a studio?” Ollsin says.